The narrow-pulse AVR-E4 series can generate 100V pulses with pulse widths variable from 1 to 5 ns, at repetition rates to 100 kHz. 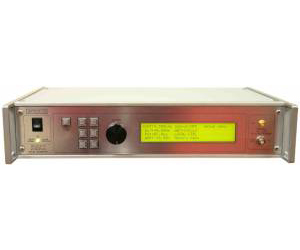 provides GPIB and RS-232 computer-control, as well as front panel keypad and adjust knob control of the output pulse parameters. A large backlit LCD displays the output amplitude, frequency, pulse width, and delay.